Arab foreign ministers considering a response to Israel's Gaza offensive say they have decided to break a freeze on aid to the Palestinian government. 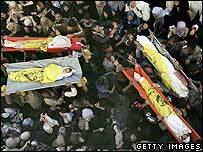 The ministers met hours after the US vetoed a UN Security Council resolution condemning Israeli actions in Gaza. 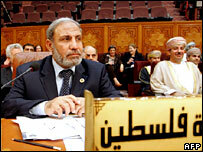 Arab League chief Amr Moussa said the veto was incomprehensible. The Arab ministers, meeting in Cairo, said they would somehow get funds to the Palestinians despite a Western-led ban imposed when Hamas was elected. The US and the European Union regard Hamas as a terrorist organisation. The foreign minister of Qatar said the Arabs were determined to find a way to get aid to the Palestinians. It is not yet clear how that will happen, given that banks have been reluctant to make transfers to the Palestinian Authority for fear of sanctions by the US. The Palestinian foreign minister, Mahmoud Zahar, acknowledged that it would take time for the funds to flow, but he said the decision would facilitate the formation of a national unity government with Fatah. Regardless of how it will be implemented, the Arab decision is above all a message to the Americans. There is anger in the region at the way the US used its veto to pre-empt a Security Council resolution condemning Israel's offensive in Gaza this week, in which 18 civilians were killed. Egypt and other Arab states have been pressing the Palestinians to form a national unity government as a way of diluting the influence of Hamas, which refuses to recognise Israel. They consider that the US veto makes their job harder and reduces the chance of any resumption of peace talks between Israel and the Palestinians.